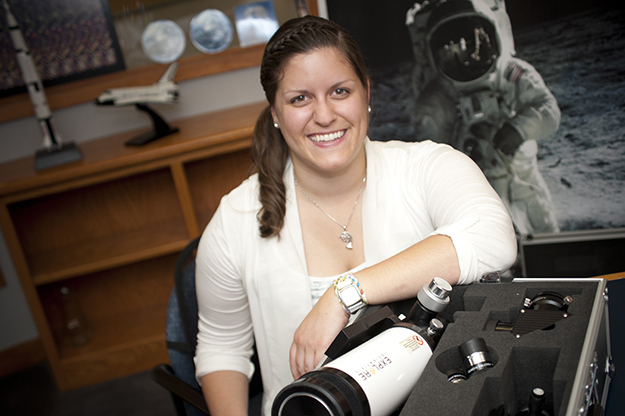 Caitlin Nolby, an alum of UND’s Space Studies Department and deputy director of the North Dakota Space Grant Consortium, along with coordinator Marissa Saad, spent nearly a year planning a recent UND-based conference that attracted representatives from every Space Grant Consortium in the nation. Photo by Jackie Lorentz. A welcome banner at the Grand Forks airport set the tone as UND hosted a national NASA Space Grant Consortium conference last week at the Alerus Center. From the banner to the venue, the 200 delegates were impressed with their North Dakota welcome. It’s the first time UND has hosted the conference, which offered some other firsts: interactive sessions and discussions with NASA officials, including Mike Kincaid, NASA’s Associate Administrator for Education. “The venue is perfect, and had everything I required plus more,” said B. Chad Starks, associate director of the NASA Delaware Space Grant Consortium, who presented an interactive session on diversity and increasing the number of women and people of color in STEM fields. 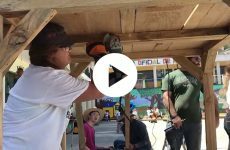 About 200 delegates from across the United States attended the conference, which ran Sept. 14-16. Lt. Gov. 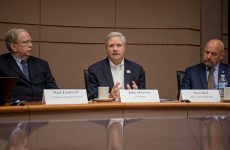 Brent Sanford addressed the group on Thursday, as did Grand Forks Mayor Mike Brown and a number of other NASA officials. “This is a great opportunity for delegates to experience North Dakota,” said Marissa Saad, coordinator of the North Dakota Space Grant Consortium, who spent nearly a year planning the conference with Deputy Director Caitlin Nolby and others. “It’s a rare opportunity to get representatives from every Space Grant Consortium in the nation,” said Nolby. 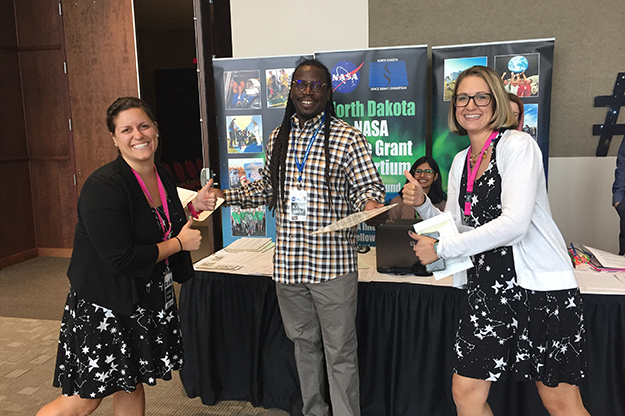 Caitlin Nolby (left), deputy director of NASA North Dakota Space Grant Consortium; pose for a photo with B. Chad Starks, associate director of the NASA Delaware Space Grant Consortium and one of the conference presenters; and Marissa Saad, coordinator of the North Dakota NASA Space Grant Consortium. Photo by Jan Orvik. The NASA Space Grant Consortium, formed in 1989, is a national network of colleges and universities that offer opportunities to take part in NASA aeronautics and space projects. The program supports STEM, science and engineering education as well as research and public outreach. 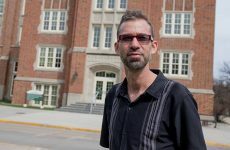 UND Space Studies administers the North Dakota program, with affiliates at NDSU, all public colleges and tribal colleges in the state, as well as other locations. Its goal is to increase STEM and technical education and contribute to the education and welfare of North Dakotans.